7 layer bean dip and the secret ingredient! 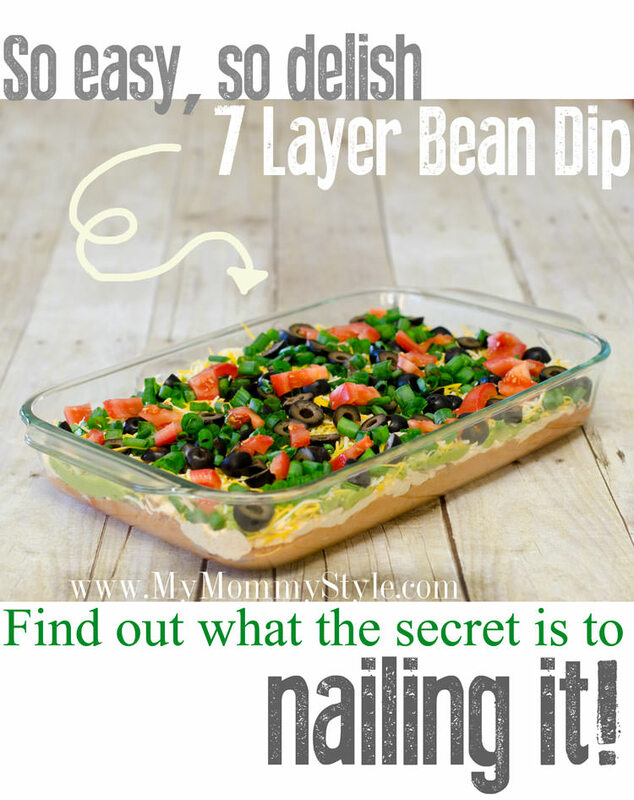 The Secret to 7 layer Bean Dip! I always thought this recipe was impossible to screw up…but I was wrong! So here’s the deal…this is super easy to make, BUT you can’t forget a couple key ingredients…as you look over the recipe, see if you can find where you may have gone wrong. 🙂 xox Hahaha. But seriously, this is the BEST bean dip appetizer ever!! **Be sure to serve with some Hint of Lime chips!! Crazy delicious! Mix the beans and ketchup. On a large serving platter spread the bean mixture. In a bowl mix the sour cream with cream cheese and one package of Taco Seasoning and spread atop beans. Smash the avocados (leaving some chunks if you like —which i DO!!) and add the garlic powder, chili powder and the juice of the fresh lemon. Add salt to taste. Spread atop sour cream/cream cheese mixture. Chop the tomatoes, olives and green onions. Finish your final layer with tomatoes, olives, and green onions. The Pin Junkie and The DIY Dreamer. I love all the flavors in this dip!